Numbers That Matter explored wellbeing and people’s understanding of data by co-designing a wearable open-data device. Data is too incomprehensible to care about. As such data wrangling has formed an elite. 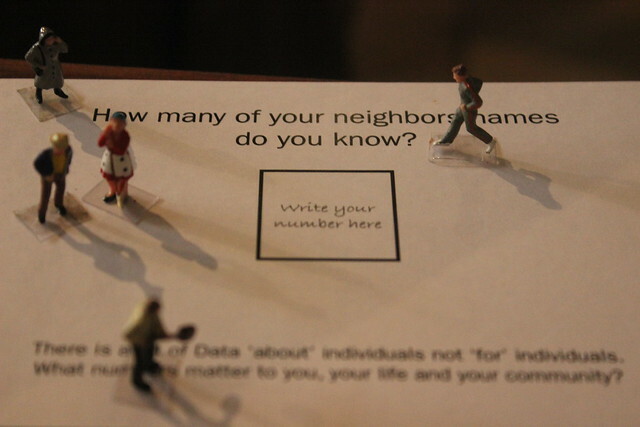 Numbers that Matter’s intention is to make individual community participants aware of the data footprint that is constantly generated and to establish what data (‘numbers’) matter to them. There is lots of data ‘about’ individuals not ‘for’ individuals. Numbers that Matter participant workshops allowed the individual to define meaning in data while at the same time increasing awareness around civic or societal issues. The aim of the project was to develop insights around civic interests that have a bespoke individual and meaningful resonance, with the intention to inform and potential to influence behaviour through the creation and use of a bespoke wearable device. We did this by making use of the vast store of open data and linking to diverse sources to enrich and distilling this as a simple but meaningful number. The project aims to make OpenData personal and relevant (serving the individual rather than civic-level participant) alongside a hack/make day, with the challenge to embody this meaningful data into a wearable or portable device, making the digital physical. Through ethnographic research with community health gatekeepers, we aimed to find out the health of a community to create a brief for a hackathon with the wider maker/hacker community. The three identified gatekeepers were taxi drivers, hair dressers and a local community centre in Gorton, Manchester. The film below was made during the OpenData/Well-Being/Wearables hackathon. Numbers That Matter Hackathon from Prohyena on Vimeo. Numbers That Matter was an AHRC funded project through the Creative Exchange of the Making the Digital Physical cluster. Project partners were Hannah Stewart, Chris Boyko, Emmanuel Tsekleves from Lancaster University, Mel Woods from Dundee University, Julian Tait from FutureEverything.